Engaging school and college students and budding designers, George will be hosting an interactive Education Hub over the course of the fashion showcase from 2nd – 5th June 2019. Promising to enlighten future university students and graduates on the ins and outs of industry life, the hub will not only offer advice from the George team including buyers, merchandisers and designers, but will also accommodate an informative programme of talks by tutors as well as CV and portfolio workshops. Getting ahead in their creative careers, each student will have access to the largest display of BA fashion talent in the world, live catwalk shows and will also be inspired by alumni and graduates; who’ll be on hand to off first-hand knowledge on university design courses and the application process. 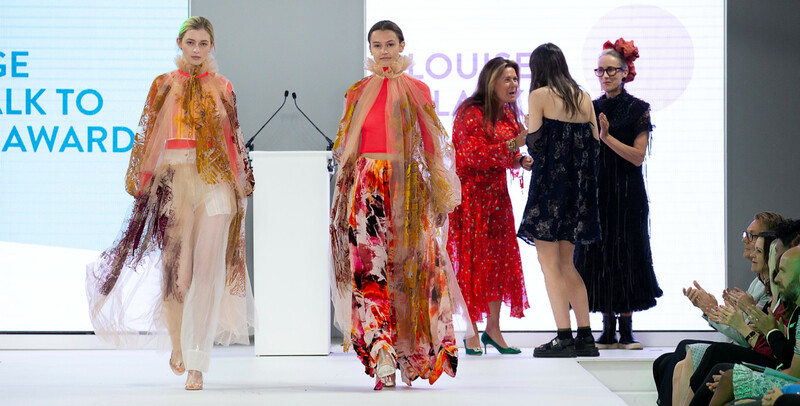 As part of the continued partnership, the popular supermarket clothing brand will once again be holding a stand within Graduate Fashion Week, in addition to sponsoring the ‘Catwalk to Store Award’ for the seventh consecutive year, where they’ll be honouring one graduate with a cash prize and an added prize to the winning student’s university. In the run up to Graduate Fashion Week, the foundation has also launched a competition alongside George, to challenge university students to design a t-shirt to honour BBC Children in Need. Creating the 2019 campaign t-shirt undergraduate designers had to ensure the garment was gender neutral and ageless whilst also showcasing innovation, manufacturing techniques and what BBC Children in Need meant to them. The winning design, by Norwich University of the Arts (NUA) final year student Megan Grinham, will be unveiled at Graduate Fashion Week’s celebrated Gala Show on June 5th, and will go on sale in 400 Asda stores around the country this Autumn, with proceeds from the sale of the t-shirt benefitting BBC Children in Need. Megan’s prize for creating the winning design will also include a two-week paid internship at George’s Head Office where she’ll be able to further develop her understanding of the fashion industry. Graduate Fashion Week is the world’s largest event for BA Fashion talent and this year’s event will be taking place on 2nd – 5th June 2019 at The Old Truman Brewery, Shoreditch, London. Tickets and registration are available now and open to everyone with a passion for fashion and design.